The IKEA Malm Bed is a popular wood veneer bed frame with a flat headboard and footboard designed and manufactured by IKEA of Sweden. Designed as an easy-to-build particleboard framework available in a range of veneer colors, the IKEA Malm Bed is a minimal and efficient bed frame for use in a variety of bedroom environments. Additional underbed storage options for extra bedding and pillows can be added below the bed frame. The IKEA Malm Bed (Queen Size) has a length of 83 1/8” | 211 cm, width of 66 1/8” | 168 cm, headboard height of 39 3/8” | 100 cm, and platform height of 10 3/4” | 27 cm. The top mattress surface of an IKEA Malm Bed has a typical height of 20 3/4” | 53 cm from the floor if a 10” | 25 cm modern mattress is used. What is the IKEA Malm Bed? The IKEA Malm Bed is a popular wood veneer bed frame with a flat headboard and footboard designed and manufactured by IKEA. Additional storage can be added below the IKEA Malm Bed. 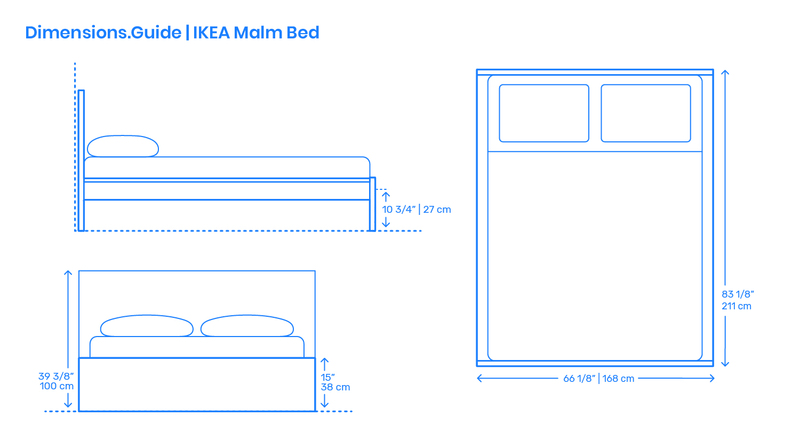 How big is the IKEA Malm Bed? The IKEA Malm Bed (Queen Size) has an overall length of 82 1/4” | 209 cm, width of 63” | 160 cm, headboard height of 36 1/4” | 92 cm, and platform height of 11” | 28 cm. How high is the bed surface on the IKEA Malm Bed? The overall bed height of the mattress on the IKEA Malm Bed is 20 3/4” | 53 cm from the floor if a typical 10” | 25 cm modern mattress thickness is used.